Once you have designed your new brochure or catalog, make sure that it gets to your intended audience by using an attractive and inviting envelope. Envelope printing services are available from most local printers and you can often incorporate many of the same graphics from your brochure or catalog into your envelop design. We spoke to the Sales Manager of Ambassador Envelope, a leading envelope manufacturer, to get some more input on how to design an effective envelope. While many people think that all envelopes are basically the same, there are actually a wide variety of styles, sizes, and features that one should consider when designing an envelope. One needs to consider how much the envelope is going to need to hold, whether or not automatic insertion equipment is going to be used, and what features are going to be required. The most common envelope is the standard #10 commercial business model with either diagonal or side seams, but there are many other choices. Other styles include Announcement, Baronial, and Booklet envelopes and there are many different seam and flap styles that can be used to make your envelope stand out. If you are going to be using automatic insertion equipment, you will want to make sure that you review the specifications with your mail house or equipment supplier to make sure that you choose an appropriate design, seam, flap, and sealing style for this equipment. One of the easiest ways to increase your response rates is to print inviting messages or attractive graphics on the envelope. 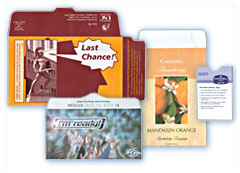 Many suppliers have the ability to offset print 4-color, process art and nearly all printers can provide basic multi-color prints at various spots on the envelope. Another great way to promote your new brochure is with window envelopes that show a large view of the brochure or catalog within it. Windows can be used to show off the piece or merely highlight some important aspects of the contents that the addressee may find inviting.